C'etait genial! When applied to the French presidential election in which Conservative Nicolas Sarkozy beat the Socialist candidate Segolene Royal by a comfortable margin, it means: that is fantastic! After decades of socialist influence in France, could the French election be a precursor to a Margaret Thatcher-like comeback for conservatives? Perhaps. Though, on foreign policy, Sarkozy is more pro-American than his predecessor, Jacques Chirac, he is still opposed to the Iraq War and doesn't want to seem too pro-American since most of the French remain firmly anti-American. But let's not look a gift horse - French or otherwise - in the mouth. Any turn away from policies that have hurt the French economy and threatened its culture with a flood of immigrants who refuse to assimilate is bound to be an improvement. Sarkozy may not be a Thatcher (whose 1979 victory in Britain heralded an economic revitalization) or a Ronald Reagan (ditto in the U.S.), but he vows to at least begin where they did. 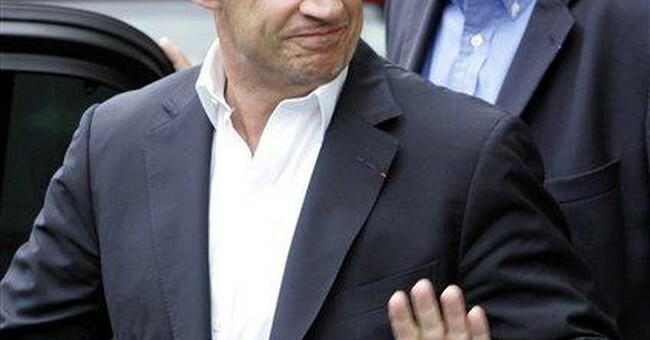 Sarkozy wants to "loosen" the 35-hour workweek by offering tax breaks on overtime in exchange for working longer hours. He wants to trim fat from the bloated public service sector, cut taxes and do something to correct high unemployment (currently at about 8.3 percent). France has also suffered from falling living standards and a decline in industrial might. Cutting taxes will help create jobs and raise living standards. When such policies have been implemented in other countries (Ireland, Britain and the United States) an economic boom has followed. The Conservative victory shows that the French are ready for that boom. Sarkozy also sounded a little like Thatcher and Reagan when, during his campaign, he promised to crackdown on criminals and curb the power of unions. Unions have been a driving force behind guaranteed jobs that have kept employers from firing incompetent workers. The French paid attention to this election. Turnout was 85 percent, a number that ought to shame the United States, which is lucky to get near 50 percent in its presidential contests. Among the most pressing problems for Sarkozy's presidency will be how to handle its estimated 5 million Muslim immigrants, some of whom shook the foundations of the country when they rioted in 2005. He will have to be more rhetorically cautious than during his campaign when he promised to rid neighborhoods of the "scum" responsible for the troubles. Still, France, which has the largest Muslim immigrant population in Europe, is faced with a major challenge to its culture, freedoms, language and everything else that makes France what it is. Sarkozy may not be the easiest person to get along with. He's been called impulsive and authoritarian. His political opponents claim he could exacerbate government relations with the poor and France's many ethnic groups. But it will be his policies, not his personality - and whether those policies are embraced by a majority of French people - that will determine his success. If personality were the determining factor in the success of a leader, Margaret Thatcher would have been a failure, as would countless American presidents, military leaders and CEOs. Sarkozy's work isn't finished. While he is expected to take office next week, Sarkozy must also campaign for his party's victory in next month's parliamentary election. He will need a clear majority of seats in order to implement his reform plan. Socialism has had a firm grip on France since 1981 with Francois Mitterand's victory in that year's presidential election. With the defeat of Socialist candidate Segolene Royal, the Conservatives have a unique opportunity to show France and the world that they can not only solve their economic problems, but also do something about the immigration invasion that has put their nation - and all of Europe - in jeopardy. American conservatives (though probably not President Bush, who is not highly regarded in France) should cultivate this rare opportunity to help a once-strong ally to become one once again.